As a mother (and booknerd) I am always looking for books that have something of value to teach my children. YOU ARE LOVED is such a wonderful thing to reinforce with children. 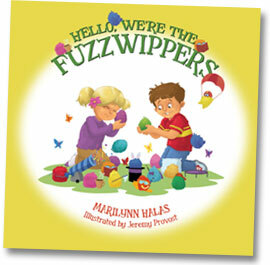 The Fuzzwippers are fuzzy little friends that connect with kids that need to feel needed, loved and wanted. With imagination, beautiful illustrations and a cute story I really enjoyed this picture book. Braden (age 5): "I like it. I really liked that the friends learned to be good friends. I also really liked the pictures. The Fuzzwippers are really cute." JD (age 4): "I think the Fuzzwippers are fun and funny"
Well I guess the children have spoken! They loved the Fuzzwippers as much as I did! Check it out for your little ones today!